Craniosacral Therapy is a gentle form of bodywork that releases restrictions throughout the body's central nervous system. Wholeness and healing is about fully integrating all aspects of the self.Becoming aware of your physical patterns, beliefs and emotions and their impact allows you to make choices about what you can change. My hands reflect back to you what the current physical pattern is, and with that witnessing, you are able to choose if you want to keep the pattern, or change it.When the physical body is free of tension, the mind becomes more flexible as well. My hands gently locate and treat areas that are restricted to encourage more movement. I focus on how your body would like to expand the movement that is already present to encourage the tension to release. I work with your body’s natural ability to heal itself in a way that is both safe and transformative. Integrated Craniosacral Therapy facilitates ease with birth and the development process itself. Moms and babies benefit from alleviating any physical and emotional tensions that may arise during pregnancy or the birth experience. "I have more opportunity to pause rather than just react to the events around me. … My migraines are gone and I feel peaceful more often in my life. I am grateful to have the gentle guidance that comes with this work. I am healthy, I have more energy and I always look forward to my next session." "I was diagnosed with Meniere's Disease, which, according to conventional medicine, is an incurable condition which causes attacks of vertigo … Then I found Heather. … I left feeling so much better, believing that she could actually heal me rather than just treat my symptoms. By the third session the vertigo was about 95% gone." "I first came to Heather for Craniosacral Therapy as recommended by my chiropractor for scoliosis. After over a year of sessions, she has not only alleviated my painful symptoms but has also helped tremendously with my anxiety, depression, tension, and overall restlessness. Craniosacral Therapy has definitely proven to benefit the body as a whole, as well as mind and spirit. " “My 12 year-old daughter suffered from acute anxiety, depression, and OCD-like behaviors since she was eight. … Finally, with Heather, we’ve made real, tangible progress. My daughter has become amazingly more calm and confident, and even has begun to take actions at home to soothe herself when feeling stressed. … Finally there is light at the end of the tunnel." Therapists will learn how to integrate structural and energetic techniques with how to provide a therapeutic presence and intuitive insights. 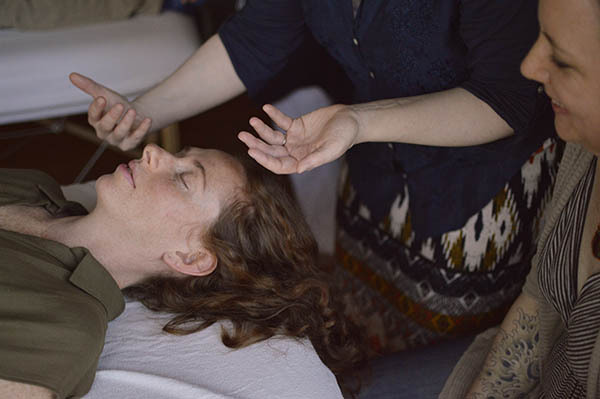 Craniosacral Therapy is an integrative process for both the client and the practitioner. ICST draws on the strengths of Upledger’s structural foundation, Hugh Milne’s Visionary approach and the Biodynamic method of focusing on your client’s inherent patterns of health. I will help you develop your unique approach to ICST and trust the information you receive on the physical and energetic levels. Personalized lessons Within a safe, open environment. A powerful Experience leading to full certification.